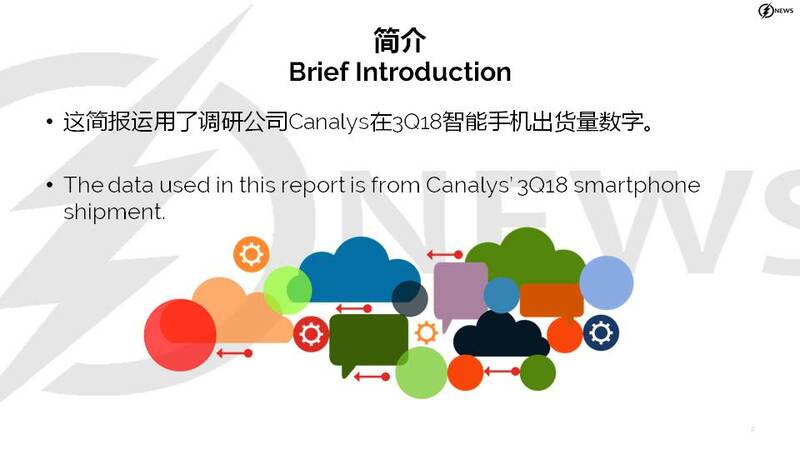 The data used in this report is from Canalys’ 3Q18 smartphone shipment. 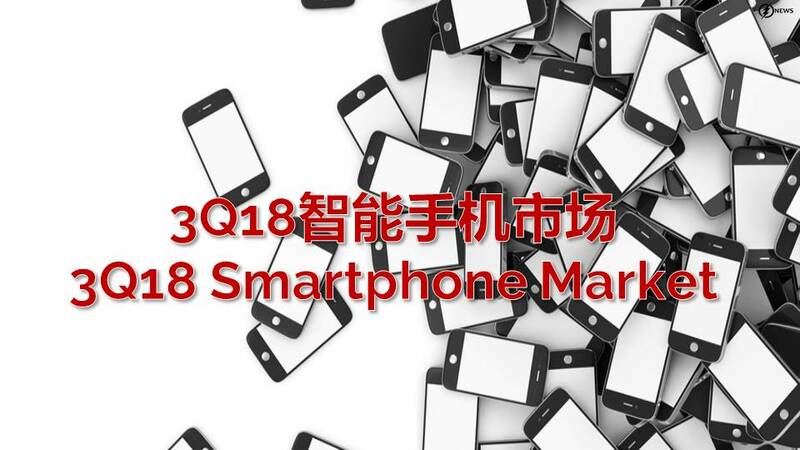 In 3Q18, global smartphone shipment reaches 348M units, mere 2.7% up on quarter, but 7.2% down on year. Samsung leads the market with 20% share. Huawei still exceeds Apple with near 15% share. 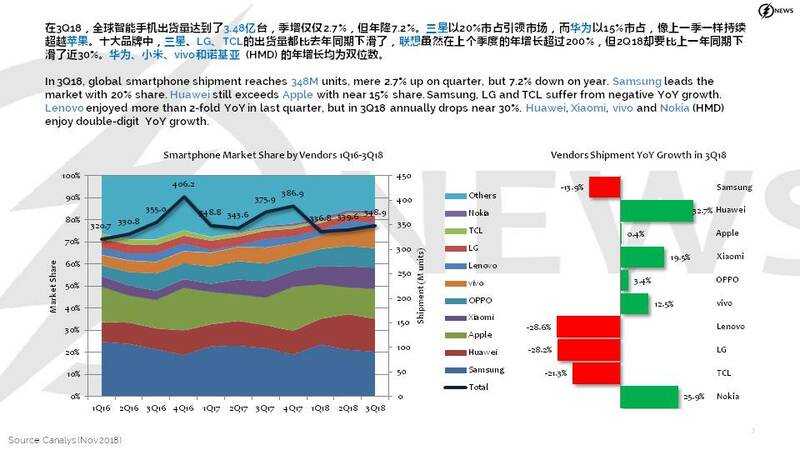 Samsung, LG and TCL suffer from negative YoY growth. Lenovo enjoyed more than 2-fold YoY in last quarter, but in 3Q18 annually drops near 30%. Huawei, Xiaomi, vivo and Nokia (HMD) enjoy double-digit YoY growth. 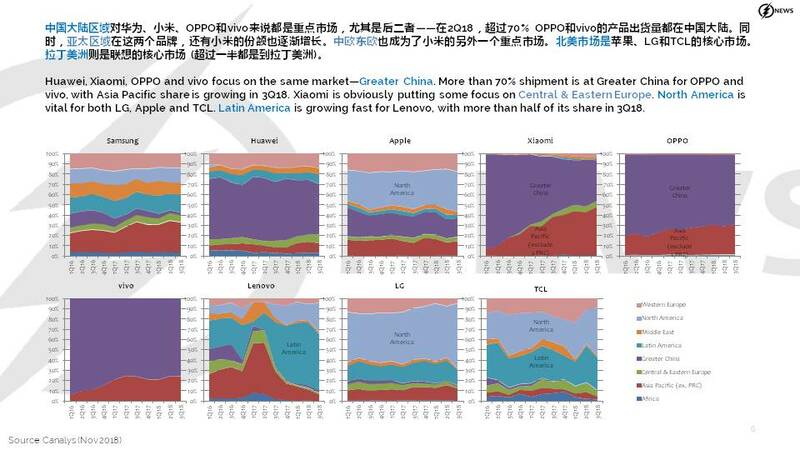 In 3Q18, Asia Pacific (mainly India) and Greater China still hold the biggest market share, with near 26% and 30% share, respectively. 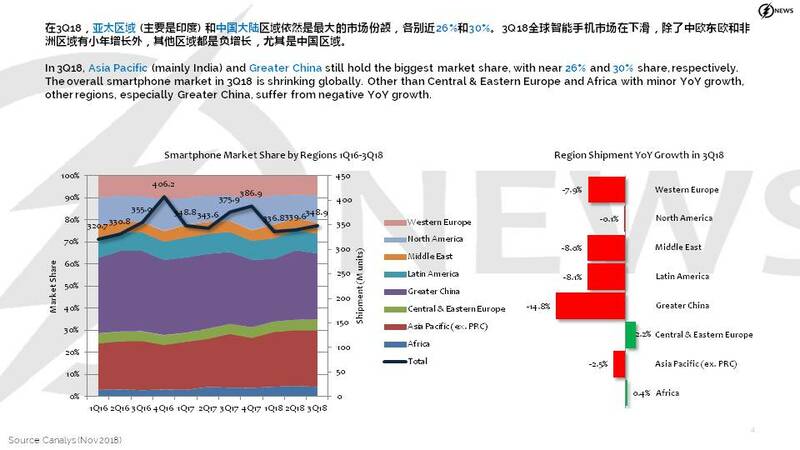 The overall smartphone market in 3Q18 is shrinking globally. Other than Central & Eastern Europe and Africa with minor YoY growth, other regions, especially Greater China, suffer from negative YoY growth. In 3Q18, Samsung is the leader in APAC, Europe, ME, LATAM and Africa regions, yet actually its YoY growth is declining. 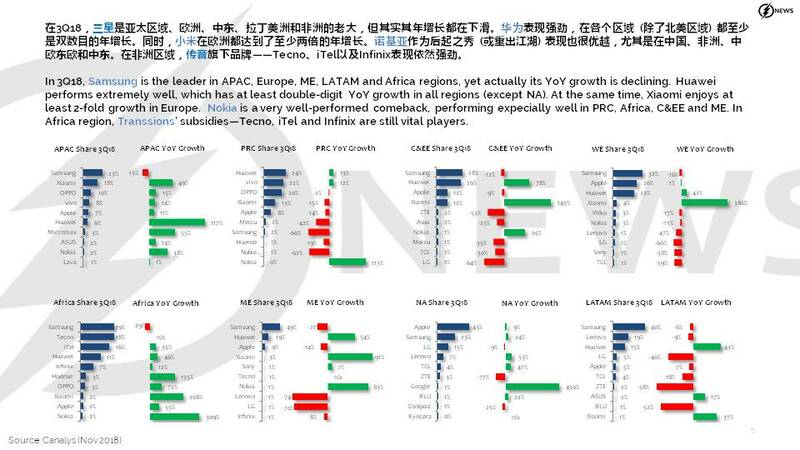 Huawei performs extremely well, which has at least double-digit YoY growth in all regions (except NA). At the same time, Xiaomi enjoys at least 2-fold growth in Europe. 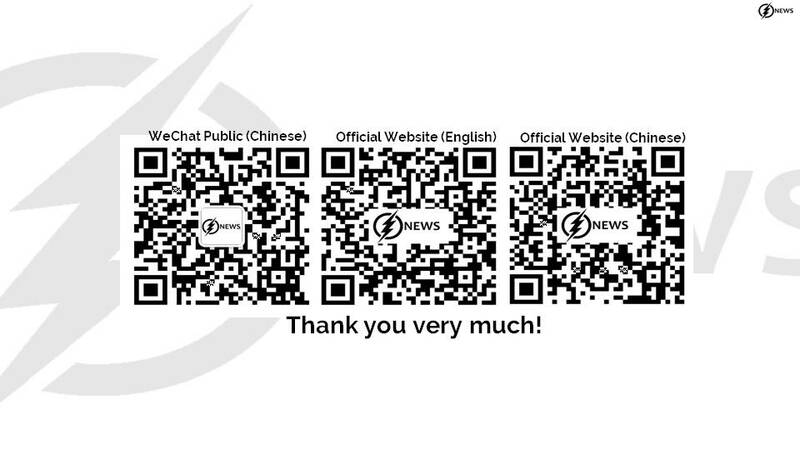 Nokia is a very well-performed comeback, performing expecially well in PRC, Africa, C&EE and ME. In Africa region, Transsions’ subsidies—Tecno, iTel and Infinix are still vital players. Huawei, Xiaomi, OPPO and vivo focus on the same market—Greater China. More than 70% shipment is at Greater China for OPPO and vivo, with Asia Pacific share is growing in 3Q18. Xiaomi is obviously putting some focus on Central & Eastern Europe. North America is vital for both LG, Apple and TCL. Latin America is growing fast for Lenovo, with more than half of its share in 3Q18. In 3Q18, low-end segment (below US$200) is still the mainstream market, owning more than 48% of the market share, yet its YoY growth declines 12%. Mid-to-high segment (US$200-400) market share grows near 8% compared to last year same period. On the other hand, high-end segment (US$400-600) grows 17% compared to last year. US$400-450 and more than US$850 have relatively small share, 4% and 8%, respectively. Yet their YoY growth is tremendously, mainly driven by Xiaomi, OPPO, vivo and Apple. Samsung and Apple are driving their share of US$850 above price segment to near 13% and 39%, respectively in 3Q18, with their flagships. 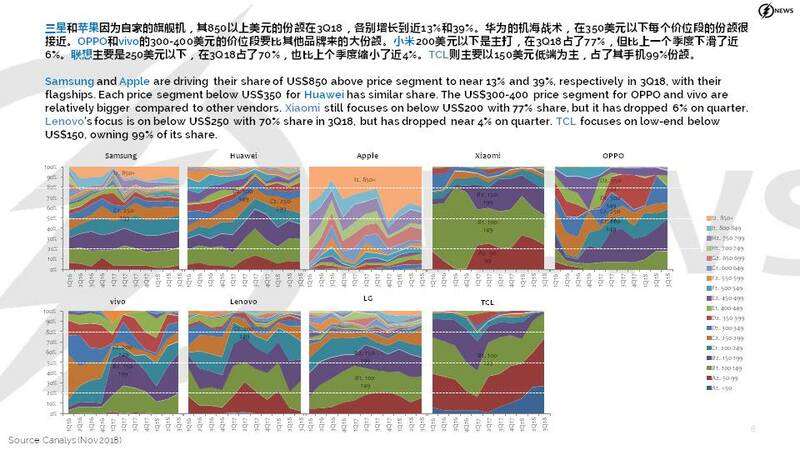 Each price segment below US$350 for Huawei has similar share. 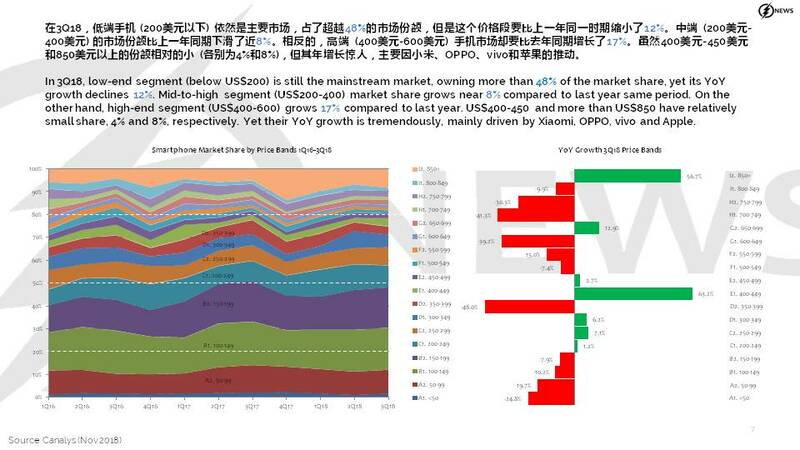 The US$300-400 price segment for OPPO and vivo are relatively bigger compared to other vendors. Xiaomi still focuses on below US$200 with 77% share, but it has dropped 6% on quarter. Lenovo’s focus is on below US$250 with 70% share in 3Q18, but has dropped near 4% on quarter. TCL focuses on low-end below US$150, owning 99% of its share. 11-11: Samsung Electronics will produce over 1M units in initial stock for its upcoming foldable phone; Samsung is allegedly developing a new Galaxy M line-up of phones; etc. → ← 11-09 Week: After a busy week, another week ahead!